Irishman Gareth Higgins represents the mind and spiritual tendencies of a generation (which he calls ''the most psychologically disintegrated in history'') come-of-age in a world dominated by the influences of pop culture. What's refreshing is his willingness to question that culture, from within it, probing its subliminal (and often outright, in-your-face) messages for what it tells us about who we are and what we believe. His medium? Film. And he's seen hundreds. Film, says Higgins, does what any piece of great art can do -- ''irritate and heal, challenge and affirm, inspire and sadden'' -- so he takes us on a whirlwind, if not comprehensive, tour. And it's fun. Organizing his commentary by subject, he moves through the Anti-Hero, Community, Brokennness, Death, Love, War, Quest and Fear by way of movies like High Plains Drifter, Magnolia, Field of Dreams, The Apostle, Minority Report, North by Northwest, The Last Temptation of Christ and Groundhog Day. His writing style is conversational and (mostly) funny, though a little indulgent in spots. Thankfully, he recognizes this, and the editors have seen fit to allow it. That said, this is a great handbook for spiritually engaging popular culture through film. Or as Higgins puts it, a chance to recognize and relish the complexities of being human. At its best, film can transport you to what C.S. Lewis called a "thin place," where the line between harsh reality and the transcendent is so subtly blurred that for a moment, you find it difficult to tell the difference. Film, in the final analysis, can do for you what all great art does--irritate and heal, challenge and affirm, inspire and sadden. 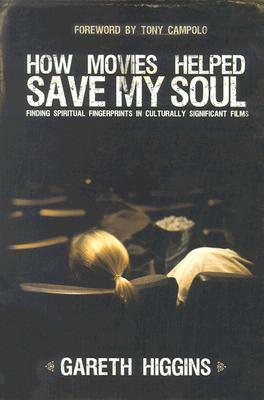 "How Movies Help Save My Soul explores the profound possibilities of movies to guide, critique and provoke the postmodern Christian journey. The book examines more than 50 films to see beyond simple multiplex fodder to encounter something transcendent in film.